Women at the top is the new axis of power-get used to it! Who rules the world,girls,a popular song says.Well,the Americans whenheading to the polls to elect a new President thought Hilary will come out victorius.But the Republican contender, Donald Trump, pulled a last minute trick out of his hat and this never happened. So she didn't get to join two other female leaders – Theresa May of GB and Angela Merkel of Germany - to form a new axis of power. This means that almost a third of the G8 nation leaders will be women. Already Christine Lagarde heads up the International Monetary Fund and for a while Diezani Alison-Madueke was the President of the all-powerful OPEC organisation. clear up the mess made by the men. Perhaps. We are beginning to see a new breed of female leaders ready to take on the world in a move never before seen since the Thatcher era. Traditionally women are better leaders (- sorry guys but its true!) They are strong, decisive and pull no punches. They are also not as scandal-prone as men, having little or no skeletons in their cupboards. The Margaret Thatcher era of 1979 – 1990 turned a bankrupt and floundering Great Britain into one of the most prosperous and powerful nations that we know today. During her regime she battled the unions, introduced capitalism across the board, whilst at the same time showing Britain’s military might in facing off the Argentines over the Falkland and taking the country into the First Gulf War. Under her rule Britain was a key player on the international scene earning her the nickname of the no-nonsense ‘Iron Lady’. With women at the top of the three most powerful nations in the world we can expect a lot of change in the world in the coming years. Even though President Hilary Clinton will initially have her hands full with domestic issues we can expect changes in areas such as world trade, migration and terrorism. All three are not novices when it comes to governing a nation and performing on the international scene: Angela Merkel has been the Chancellor of Germany since 2005, Theresa May is a former Home Secretary and Hilary Clinton was Secretary of State in President Obama first cabinet. Collectively, with their joint experience, they can steer the world on to another course. As any married man knows fully well you can’t argue with a woman; they are better at putting an argument across( and getting their own way! ), they are better negotiators, more thick skinned and are a lot better at dealing with(or ignoring!) criticism levelled at them. Without a doubt there will be feminists out there who’ll think it’s time to dust off their placards and take to the streets – they’ll be wrong! These new leaders are not bra-burning feminists but competent leaders who have proven themselves in a predominantly male-dominated chauvinistic environment. They don't have’ to prove themselves any further to make a point or statement. Women leaders, unlike their male counterparts, tend to think of the bigger picture and as a result their policies will be more diversified. They also well known for their ability to negotiate peace deals – something the world desperately needs right now with all the trouble hotspots. Women leaders are not scared to fight when necessary; Margaret Thatcher fought the Argentines over the Falkland’s and when PM Theresa May was asked whether she was prepared to authorize a nuclear strike, if need be, that could potentially kill over a 100,000 men, women and children with a nuclear bomb she replied with a curt ‘yes’. Women leaders are prepared to fight just wars if need be- when there is no other option. They won’t rush off and fight an unjust war like Blair and Bush did. Having said that one of the areas they are bound to focus on will be the turbulent Middle East – and they won’t be afraid to use military force if necessary. Dealing with Russia, China, Iran and North Korea will also be high on the cards. 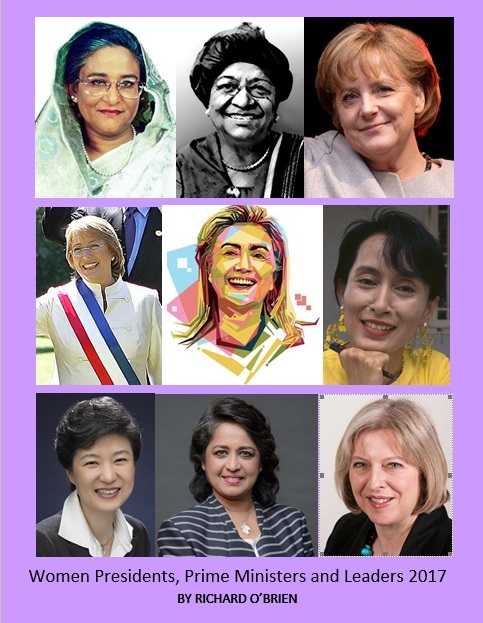 There are currently twenty-two female leaders in the world today running their countries in the capacity of President, Prime Minister or Monarch ( the Queen of England). With the exception of ex-President Dilna Rousseff of Brazil who was recently impeached all the other leaders are running their countries comfortably.